If I could just say anything, it would be thank you. Thank you for the 20 years of sacrifice. Thank you for the story you’ve told with every shot, miss, dunk, pass, layup, win, loss, and now we have the honor to witness the final chapter. You are someone I take inspiration from and want to let you know that I thank you. I was born in Los Angeles in 1999, and been a Laker fan for as long as I can remember. My first pair of sneakers that I actually ever begged for were the Kobe 3’s that were all black. Kobe, you are a legend in my eyes. You taught not just me, but kids everywhere that you never stop fighting. I watched as you were at your highest and when you were at your lowest. Nevertheless, every year you personified the meaning of perseverance and greatness. I watched you in awe as you scored 81 points, as you broke fingers and played on, as you went through a scandal that threatened your career and yet you kept going. I had the honor and pleasure to watch as you taught us that against all odds, the fight will always continue. I watched you when in 2008, you lost in the NBA Finals to the Boston Celtics and everyone had doubts. I kept wearing the jerseys and shoes, hoping and praying for your success. You are just so much more to me than a basketball player; you are a man who has shown the true and great values of grace and taking pride in your work. Your work ethic, mind, and natural ability for the game of basketball, and love for the sport is unlike anything I’ve seen. In 16 years, I’ve seen Barack Obama become the United States’ first black president, LeBron James play basketball, but nothing has given me more joy than to watch you play. I wish I could go back to that day; the first day I fell in love with the game of basketball because of Kobe Bryant. I wish I could go back and tell myself to enjoy and cherish every moment because its going to come to an end. I never thought that I’d have to say goodbye. I never thought that I’d play as the Lakers in video games and see your name missing. I never thought that one day I’d say that it’s your final season. I never thought that I’d have to write this goodbye letter. Never in my years would I think that I shed a tear as you may never know me and what you did for a little kid that saw something greater than just the game of basketball. You gave a little kid a reality that anything in life can be accomplished. You showed me that against all odds anything is possible. We may never meet, you may never read this, you may never even check this website, but in one in a billion chance that you do, thank you. I never thought that I’d have to watch your last game, but though I’ll admit I might shed a tear or two. My mom has always told me that nothing in life is given to you; you have to fight, you have to fight every second of every day to get to where you want to be in life, and never to be satisfied. You are the visual example of this. If there’s anything I could say to you, anything at all, it would be that those 20 years of pain, loss, grief, defeat weren’t in vain. Those years of victory, triumph, and greatness were appreciated. Your effort, your play has inspired others. 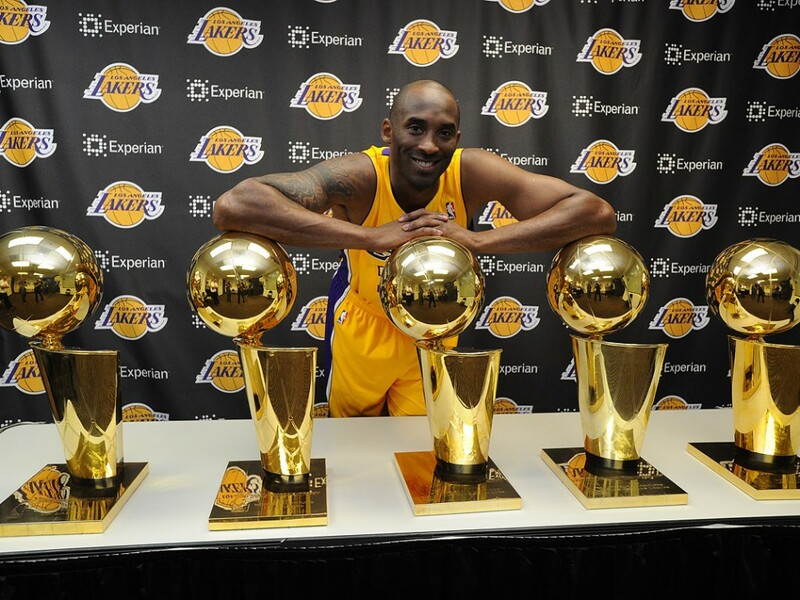 As a Laker fan, as a Kobe fan, if there’s anything I could say to the five-time NBA champion, two-time NBA Finals MVP, one-time NBA MVP, to the third leader in all-time scoring, and 18-time NBA All-Star, thank you. As the curtain closes, I’ve cherished every moment, every opportunity, and every single second. If there’s anything I could say, anything at all, I’d just say… thank you.